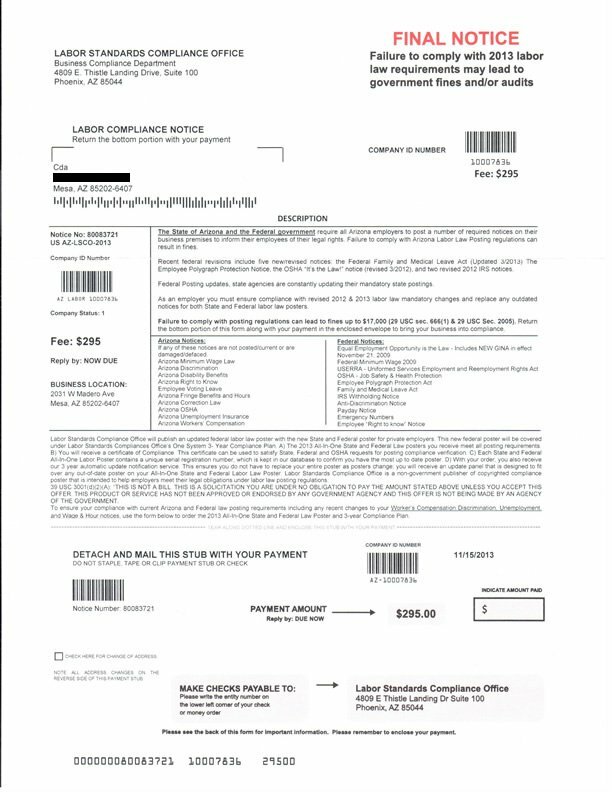 Yesterday I received a letter that looked like a official government document from the ‘Labor Standards Compliance Office’ showing a fee of $295 with the words ‘Reply by: DUE NOW’. In the upper right-hand corner there were big red letters that said ‘FINAL NOTICE’ and ‘Failure to comply with 2013 labor law requirements we lead to government fines and/or audits’. This letter looked official but was actually a scam trying to get me to pay money for a poster, a $295 for poster. Here is an article about the scam. Arizona AG warns small businesses, consumers on fake mailers.